As noted in previous blog posts, forensics has numerous specialty areas. One of those specialties is botany. 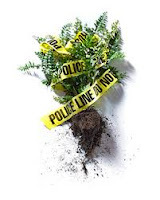 Forensic botany is the application of plant sciences to criminal investigations. Similar to DNA and fingerprinting, plant material (seeds, leaves, flowers, spores, wood, fruits, cells, hairs and glandular hairs) is often unique to certain plant species and ecological areas. This allows a forensic botanist to narrow down the possibilities surrounding the who, where, and when of a crime. An example of this is the comparison of pollen at a crime scene and on a suspect. Because even common plants have their own unique combination of pollens at different locations, the botanist may be able to link the suspect to a particular crime scene or determine that the victim has been moved from the original crime scene. Another example is the use of botanical evidence to find “clandestine” graves by examining the changes of disturbed soil. Botanists are knowledgeable about the plants that typically invade disturbed surfaces. The study of trees and roots is also helpful in an investigation, often for determining the elapsed time of death. Growth rings can be counted to provide the timing of an event, and even partial damage to root growth can suggest the period since an interruption occurred. The first reported trial that used the expert testimony of a botanist was the Lindbergh baby kidnapping case. Dr. Arthur Koehler was an expert on wood anatomy and identification with the United States Forest Service. He studied the ladder used by the kidnapper, and subsequently presented three kinds of information – identification of the wood used, physical marks left by tools on the wood, and comparison of the wood structure. By matching the annual rings on the wood, Koehler was able to show that the attic board in Bruno Hauptman’s home and the ladder rail had once been a single board. This was one of the most incriminating pieces of evidence in the trial that led to Hauptmann’s conviction. In the eighty years since the Lindberg trial, the value of botanical trace evidence in criminal and civil cases has been used to bring justice to innumerable victims.